Don't let anyone tell you that real estate is only about location, location, location. More and more, it's also about image, image, image. 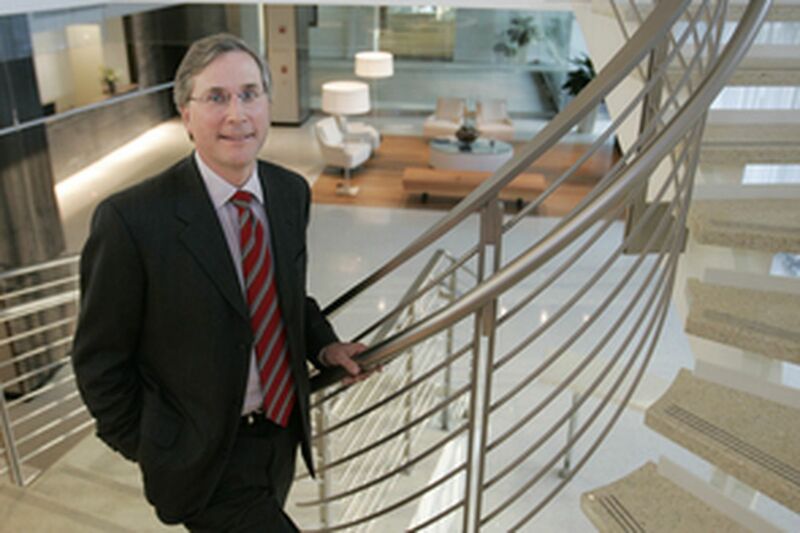 Jerry Sweeney, who runs Brandywine Realty Trust, was always good at the location part. His property company had amassed a fat portfolio of suburban office buildings in the region's most sought-after hubs and corridors. But there was nothing in the batch that could make an architecture snob swoon until Sweeney built the Cira Centre. The effect of that glittering crystal shard on the Philadelphia skyline was like a sharp splash of astringent. When it debuted in 2005, the Cesar Pelli-designed tower marked the end of a decades-long drought of decent architecture in the city. The little skyscraper became an instant landmark that reset the city's skyline. Cira was so transformative that it eventually led Sweeney to rethink the face his company presents to the world. In the B.C. era (Before Cira), Brandywine was content to operate out of a ponderous, off-the-shelf Plymouth Meeting mid-rise, where the decor was heavy on dark, law-firm-style woods and the corridors always marched in straight lines. But it soon became clear that any business that was ambitious enough to build an urban icon required digs as fresh as Cira. The fast-growing company, now ranked the nation's fourth-largest real estate investment house, is just settling into those new headquarters in the Radnor Financial Center on Lancaster Avenue. While no one will ever mistake it for the home of a rambunctious Center City ad agency or Web designer, its crisp modern aesthetic represents a breakout for a firm that made its name trading in squat suburban offices. The design, by Richard J. Farley and Patrick McGranaghan of Kling Stubbins (as the Philadelphia firm now calls itself), is corporate enough to satisfy Brandywine Realty Trust's gold-plated clients. Yet its interiors have enough dash to suggest that real estate investment can be a creative, edgy business. With exposed steel beams and pipes, and a floor plan that splays into diagonals and curves, Brandywine's offices share something of the aesthetic of a Northern Liberties factory loft. But it's also a space that greets visitors with sleek all-white furniture and a floating helix of staircase, also white, that is a modernist's spin on Tara's grand stairs. Though other parts of Brandywine's bilevel offices are more reserved, the overall design conveys a sense that this is a company fizzing with energy. In the past, advertising and marketing might have been the means of choice to express that corporate identity. But increasingly we're seeing architecture moving into the communications and branding business. The notion that design can promote a corporate identity has been embraced most assertively by media giants such as Hearst and the New York Times, both of which hired renowned international architects to craft statement headquarters in Manhattan. But even in Philadelphia, where self-promotion remains as suspect as a rapper's boast, Urban Outfitters has tried the same trick with terrific results. It just finished a new headquarters at the Navy Yard that serves as an architectural mirror of its fashions. Brandywine didn't initially see its headquarters as a way to telegraph its corporate identity; it just needed more space for its 125 workers. The investment trust has been on a tear, buying up property holding companies in Austin, Texas; Washington, D.C.; and Oakland, Calif. Then in 2004, Brandywine took over Philadelphia's Rubenstein Co. and inherited five Radnor buildings. The prize in that deal was One and Two Logan Square. The Radnor buildings, once occupied by Wyeth Pharmaceuticals, were seen as a dowdy throw-in. Renovated in the 1970s by GBQC, the Lancaster Avenue flagship was sheathed in a vast dark expanse of brown glass. Although the building could claim the unusual flourish of a pointed brick prow, its front facade made a sullen impression. Initially, Sweeney said, his only goal was to update the building's looks and modernize its systems. But he soon realized that installing Brandywine's headquarters in the flagship could be a catalyst to "reposition" the complex and market it as Class A office space. Because the five buildings contain as much room as Philadelphia's Liberty Place - 1 million square feet - they were able to support an enticing mix of uses that now includes a branch of Susanna Foo's restaurant, a steakhouse, and a Philadelphia Sports Club location. Before Kling could help Brandywine refine its new corporate look, it first had to attend to the exterior and break down the formidable scale of the Lancaster Avenue facade. It did so by peeling off the brown glass and replacing it with a pale green version that is segmented by thick sculptural mullions. But while the building, rechristened "555," is lighter and friendlier than before, there's only so much that could be done with the existing frame. The architects had more success with the rear entrance. Flanked by a new sitting plaza, restaurant access, and a transparent glass box that houses the sports club, the back of the building throbs with activity. What a shame that it's not the side you see from the street. Kling's specialty is high-gloss, modernist corporate architecture. It can be beautifully understated, though the designs can have a certain sameness. What saves them is Kling's consistently elegant detailing, like the half-ton steel door at the entrance to Brandywine's lobby. Sculpted to resemble an aircraft wing, it pivots with the touch of a finger. Such handcrafted touches imbue Brandywine's offices with a rare individuality and quality. The only break from Kling's sleekness is Sweeney's own office, a glass box divided by a rustic tan-brick fireplace. One side has a modern glass conference table; the other, a grouping of traditional furniture Sweeney brought from his previous office. Sweeney means to replace the old stuff. He's just been too busy shaping the new look of Brandywine to work on his own space.